The year was 1965. 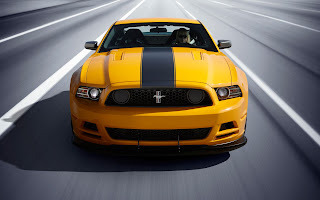 Having successfully launched the Mustang in the United States the previous year, Ford was hoping to promoate the car in Europe through motorsports. Already the Mustang had taken a 1-2 class victory at the Tour de France Automobile road rally the year before with the support of Holman & Moody, and Ford’s top brass held a meeting to discuss how to become further involved in racing in Europe. After a chance meeting with executives Martini & Rossi (who would form Martini Racing a few years later), the two companies decided to join forces to build a Mustang race car that would compete in road rallies. With Martini & Rossi providing the sponsorship funds, Ford shipped over a 1966 Mustang fastback fitted with parts from the Shelby GT350R as well as Ford’s Indy 4-cam engine for the purpose of endurance testing. Since the export version of the Mustang was known as the T-5, the new race car was dubbed the T-5R. It’s a fascinating story, and realistic enough to be true. Sadly, it’s not. Instead, it’s the fictitious back story created for this custom 1966 Mustang by Steve Strope, owner of Pure Vision Design. Strope says he gives back stories to all his projects, but this one is perhaps his best yet. After seeing this very special Mustang debut at SEMA this past year, we caught up with both Strope and the car at his shop in Simi Valley, CA to get a better look at what could be the coolest classic Mustang ever built. For the exterior of the Martini Racing Mustang, Strope blended the look of a Shelby GT350R with a rally car, all somehow packaged in a way that doesn’t look too overdone or complex. Several fiberglass body components from Maier Racing – the hood, 2-inch flared fenders, front and rear bumpers and lower valence – provide a slightly more aggressive appearance, while the front end has been given the full rally treatment with four driving lights. The front fascia has even been reworked to fit a spoiler lip from a 1969 Mustang. There’s plenty of cool exterior details that aren’t as easy to spot as well. For example, the taillights are Euro-spec, a nod to the T-5. The hood hinges have been shaved down, and both the hood and trunk are held in place with quick-release pins. Shelby cues include the side scoops and the plexiglass rear window designed to allow excess air inside the cabin to exit. Bringing the exterior look together is the Martini Racing livery, made famous thanks to its application on hundreds of race cars throughout the world for the last half century. Our favorite part of the outside of the car, though, are the four-spoke knock-off wheels, custom built by EVOD Industries and styled after the 1965 Lotus Ford Indycar. The interior of the Martini Racing is perhaps even more impressive than the outside. Again, the styling is a combination of the Shelby GT350R and a vintage rally car, pulling design themes from both. The rear seats have been removed with a Shelby R-style roll bar fitted in its place, a Shelby R radio delete plate holds a rally clock and chrono, and the side windows are manually operated plexiglass just like the original race car. Blue leather covers the Euro-style sports seats and door pads, all stitched together in colors that mimic the Martini Racing stripes on the outside. A period-correct Momo Prototipo steering resides front and center, fitted with a quick-release system from Flaming River. As with the exterior, the beauty of the Martini Racing Mustang’s interior is in the details. A custom gauge panel fabricated from aluminum now houses AutoMeter gauges, and the dash has been modified to hold various switches and warning lights. In true rally car fashion, a map light has been fitted to the passenger side A-pillar, and an aluminum foot support has been put in place in the foot well for a navigator. Housed in the glove box is a vintage ’60s flashlight in the event of night racing. The pedals have been lifted from a genuine Shelby 427 Cobra, and the shifter is fabricated from billet aluminum. The heart of the Martini Racing Mustang is what truly sets it apart from other custom pony cars. Instead of installing a big block V8 or even a race-prepped 289 like one in the original Shelby GT350R models, Strope fitted a Ford 4-cam Indycar V8 from the 1960s, similar to the one that powered Jim Clark’s winning car in the 1965 Indy 500. With its individual trumpet intakes, it’s one of the most beautiful engines we’ve ever seen tucked in between the fenders of a Mustang. The engine has been modified to make it more street friendly with a lower redline and less aggressive cams, and the mechanical injection have been converted to an EFI system courtesy of Ed Pink Racing Engines. A starter motor also rides piggyback on the bellhousing, since the engine wasn’t originally fitted with one. In an effort for the V8 to make more torque in the lower rpm range, the displacement has been bumped up from 250ci to 291ci thanks to an increased stroke, although a lower redline comes as a result – 7,500 down from 9,000 rpm. In total, the engine produces 426 horsepower and 362 lb-ft torque, impressive figures given the displacement even by today’s engine standards. Mated to the Indycar V8 is a 4-speed transmission from C&R Performance. The gearbox was initially used in NASCAR but was banned because it was too light, weighing in at an incredible 63 pounds. The transmission is actually partially visible inside the car, thanks to a heavily modified transmission tunnel. While the visible aspects of the Martini Racing Mustang are all vintage, underneath the car is where the modern technology lies. The factory suspension system has been completely removed and replaced with all new components from Detroit Speed, Inc. At the front is an adjustable coilover system with upper and lower control arms, all fit inside a cast aluminum cradle, and the rear boasts a four-link setup with a panhard rod and anti-roll bar. Strope didn’t rely on vintage technology for stopping power either. A set of Wilwood disc brakes are at all four corners, utilizing 13-inch rotors and 6-piston calipers. Perhaps what’s most impressive about the underside of the car, though, is how clean it is. Not a single wire can be seen, as everything has been run through the bodywork and out of sight. Despite what you might think, Strope says the Martini Racing Mustang is more than just a show car – it’s built to drive and drive fast. The modern suspension and brakes combined with the light weight of the car – just 2,900 pounds make for quick and nimble handling. Despite the spartan interior, it’s also fairly comfortable to sit in as well. Pure Vision Design may not have built the most outrageous, the fastest or the most powerful Mustang we’ve ever seen, but it may be the most impressive. The attention to the smallest details, the level of fabrication required, the overall design theme and it’s tribute to automotive history (both in truth and creative fiction) make it a truly unique and special car. 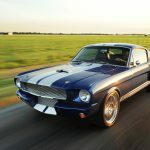 This entry was written by by MustangsDaily (Mustangs Daily) and posted here on Tuesday, May 28th, 2013 at 8:04 am and is filed under 1966 ford mustang, Feature Cars, Headline, martini racing, martini racing mustang, pure vision design, pure vision design martini racing mustang, steve strope. This article was not written by us, rather gathered using RSS feeds listed here. We take no credit for this article. You can leave a response, or trackback from your own site.